It gives me great pleasure to welcome Talya Tate Boerner to share her thoughts on gratitude today. I met Talya through a Facebook group for bloggers and love her writing style, her humour, the songs she chooses to add to her posts and her warm and friendly manner. Originally from Arkansas, Talya now lives in Dallas, Texas, USA. 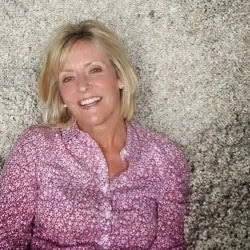 Her blog, Grace, Grits and Gardening , showcases her many interests and her stories of food, farm, family and fun. Follow Talya on Facebook, Instagram, Twitter and Google +. November has become synonymous with gratitude. On Facebook, many people are participating in the Thirty Days of Gratitude challenge—posting one grateful thing each day in November. Since I already bombard my friends with blog posts and quotes and pictures several times a day, I decided they (you) would be grateful if I declined to participate in this. Instead, I found another way to work gratitude into November. After I record my setting, I write for however long I feel like writing… Later I can go back, review where I was on a particular day, and remember what I was thinking or feeling. This November, I decided to add something I’m grateful for at that moment. My daily writing may or may not be about that particular thing—that’s not the point of this exercise. If I begin each day focused on one thing I’m grateful for instead of something I want or think I need, my entire day is set in a positive tone of thanksgiving and gratefulness. 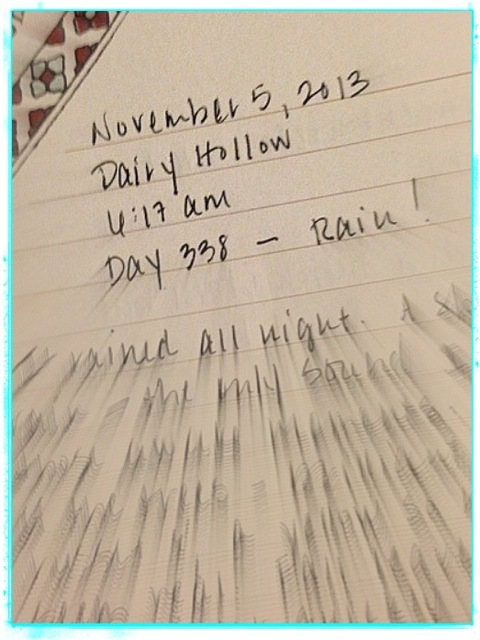 On day 338 of my writing practice, I was grateful for rain. I encourage you to start each day, whether you write or not, with a bit of gratitude. No matter how small. Great idea Talya. It is really the little things we are grateful for that bring us the greatest joy. Lately, I’ve been reading (and reformatting) some of my own journal entries from as far back as 1998. I wrote about stuff that bugged me rather than stuff I was grateful for. But even that has given me an interesting insight. At the time I wrote a lot of these entries, whatever it was that was foremost on my mind–that caused me to rant indiscriminately for paragraphs at a time–was so important to me. So important that I cannot now remember what most of it even was about. So what I’ve learned is: don’t get too overcome by whatever has you in its claws right now. chances are you won’t even remember it in the long run. Fantastic way to start the day! Think I’ll give it a try. Thanks, Talya! Talya, your post is short, but really effective, just like ‘Little Master’ Sachin Tendulkar! Your gratitude for rain would be shared by all those who have faced a water shortage at any point in time. As always, I enjoyed reading your post. I keep a gratitude journal a little differently, but begin my day as you do. Today, I’m grateful for your friendship and all the help you have given me as slog my way into the world of blogging. And for connecting me with Corrine! If not for your generous support and patience, I’d probably still just be talking about writing a blog! Thank you! Love you much! Love your take on the daily gratitude journal idea, Talya. I must try that. I like how you record the date and time you wrote, too and write something you’re grateful for, even if it’s some small thing like coffee. On second thought, coffee isn’t a small thing. It’s BIG! I am grateful every day for my coffee!! A small effort on our side each day will surely lead to bigger happiness in the coming days….Lovely thought Talya…Thanks!! 15 years ago , i had the practice of writing the day’s events , good and not so -good events and would ready the day’s events of a year ago and compare them. I would do this before retiring to bed and would take about 10 minutes but would love this 10 minute programme. I think I should re-start it.